Mr. Lawless, the Author of "Capitol Hill's Criminal Underground," claims to have uncovered an alleged, multi-billion-dollar municipal bond fraud. The book was a result of a three year investigation. The SEC accepted his multiple SEC whistleblower complaints and has assigned them to a senior attorney. He is now ready to share any possible rewards with all contributors to the "Go Fund Me - Capitol Hill's Criminal Underground, Prosecution Fund." Mr. Lawless claims to have uncovered a multi-billion-dollar municipal bond fraud. “Assistance and information from a whistleblower who knows of possible securities law violations can be among the most powerful weapons in the law enforcement arsenal of the Securities and Exchange Commission. Through their knowledge of the circumstances and individuals involved, whistleblowers can help the Commission identify possible fraud and other violations much earlier than might otherwise have been possible. That allows the Commission to minimize the harm to investors, better preserve the integrity of the United States' capital markets, and more swiftly hold accountable those responsible for unlawful conduct. 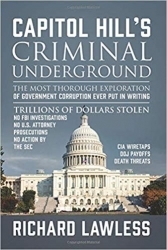 Mr. lawless is the author of “Capitol Hill’s Criminal Underground.” The book was the result of a three-year investigation in which Mr. Lawless worked with the FBI, attorneys general and U.S. Intelligence Services to uncover an alleged ongoing criminal enterprise. As stated in the book, Mr. Lawless filed multiple SEC claims and has reported these alleged crimes to the FBI numerous times.